(SPOILERS) I’ve never been much of an anime buff. I dutifully watched Akira, which didn’t impress me all that much, and I caught at least some – or that should probably be quite enough – of Legend of the Overfiend on its first (British) TV screening. 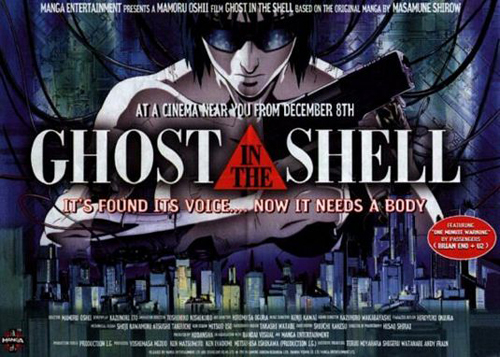 Ghost in the Shell was something of an exception, however, wearing its ideas on its cybernetic chin and as stylish as it was cerebral. Revisiting it as a prelude to the release of its US live-action remake, the visual aesthetic remains as indelible, but most notable is how strongly it has been both influenced and influential. On the debit side are Blade Runner – enormously so – but also Robocop. 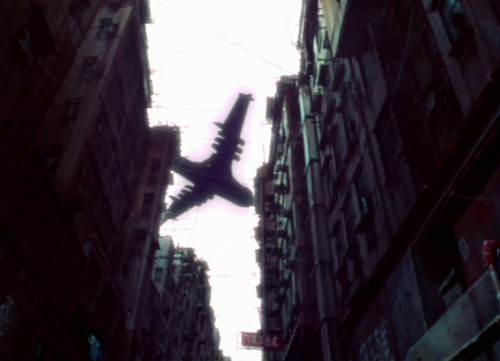 You can see the former most superficially on a design level, in its used-future cityscapes and the willingness to engage in ambient longueurs between scenes or action. This is an animated movie with an active interest in distilling mood and melancholy. If Ghost in the Shell is unable to go quite as far as Blade Runner, that’s partly because it misses the latter’s eschewing of over-verbalised ruminations on the nature of humanity. Sir Ridders’ film gave just enough to enable tone and performance to do the heavy lifting. Of course, here there’s a much denser backstory to be explained, with its cybernetically-enhanced humans, full cyborg bodies (the ghost being the soul in a manufactured shell) and the development of AI. The consequence being that the picture gets bogged down in its own wordy exposition at times. Motoko: Perhaps the real me died a long time ago. And I’m a replicant made with a cyborg body and a computer brain. Or maybe there never was a real “me” to begin with. 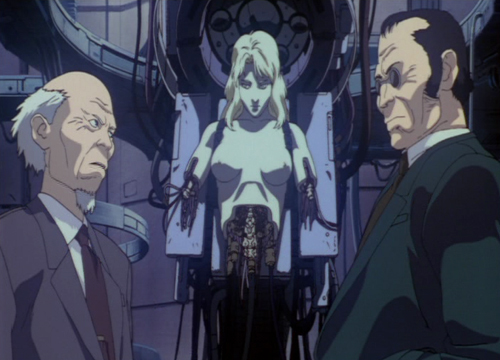 But it does mean that Ghost in the Shell has a distinctive enough palate of ideas to differentiate it from being a mere Blade Runner imitator; we’re more concerned with Major Motoko Kusanagi’s ruminations on what it means to be human than the AI’s, although that does come into play later, when the Puppet Master is given voice. Indeed, the up and down and back and forth on the subject here, for a 22-year-old film, has renewed currency with Elon Musk’s raving intent to merge the human brain with AI (and, given the way these things tend to happen by stealth, I use raving more to imply that he’s a deranged mentalist than that his transhumanist “vision” is unlikely to happen in due course). Regarding the veracity of her identity, Motoko speculates “Maybe all full replacement cyborgs start wondering like this”, further observing “I believe I exist based on what my environment tells me”. And, in an environment where everyone has implants and anyone can be hijacked with fake memories (“Your family exists only in your mind” one hacking victim is told), Ghost in the Shell provides a too-plausible harbinger of what might not be as far round the corner as we like to think. After all, much of the motivation here is already common currency. The mysterious Project 2501 was created “for industrial espionage and data manipulation”, which in the current age of passively complicit mass observation and the suggestions of intelligence services’ capability of faking foreign governments’ intelligence services’ hacking abilities seems like an entirely credible baseline incentive. The argument of the AI itself, pertaining to what it wants, is much more ambivalent and less threatening than envisaged by the prophets of doom of a Musk-scented future. All it wants, like Roy Batty, is to have the same opportunities as a bona fide human (one amusing line finds the AI demand “As an autonomous life form, I request political asylum”), and “To be human is to continually change”; thus, he proposes merging with the Major (so able to die when her physical brain dies) such that “You will bear my offspring in the net itself and I will achieve death”. 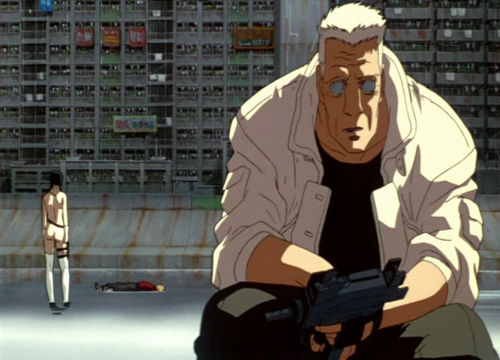 The Major appears to have few qualms about this, and Ghost in the Shell is generally sharper in reflecting our stealth reliance of gadgetry (once we have handheld items for every purpose, the next step is guiding us to a point where we casually accept their implantation) than the more profound impact of entirely surrendered physicality. Indeed, focussed as it is on more abstract philosophising, it’s approach is almost clinical. As such, there are notable comparisons to be made with Robocop. 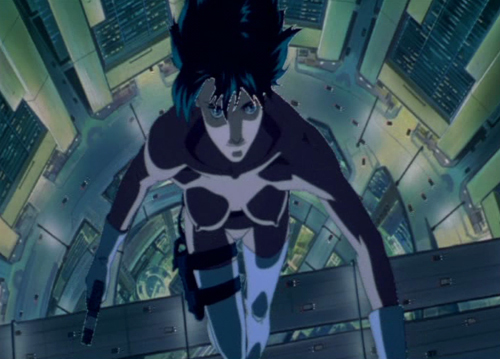 Apart from the obvious visual signposting – the action sequence finale, in which Motoko fights the walking tank is a straight lift from Murphy’s set-to with the ED209, which is further riffed on in his fight with Robocop 2 – Ghost in the Shell fails to come to grips with the effect of the ruination or loss of the physical body. In Robocop’s case, this resonates through swift, bold, but highly effective strokes as Murphy returns to his family home, now for sale, and flips out as he is beset by memories of the life of love and warmth to which he can never return. His later use of baby food for target practice further underlines his emotional and physical emasculation. 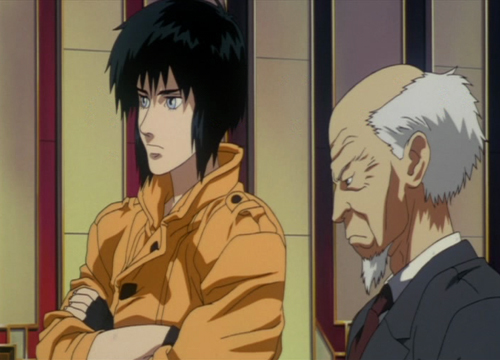 Contrastingly, Motoko betrays unnerving acceptance of her flesh and blood-deprived state. And yet, being what it is, deriving from a genre based at least substantially on titillating teenage boys, Ghost in the Shell is all about the body, specifically the female body. 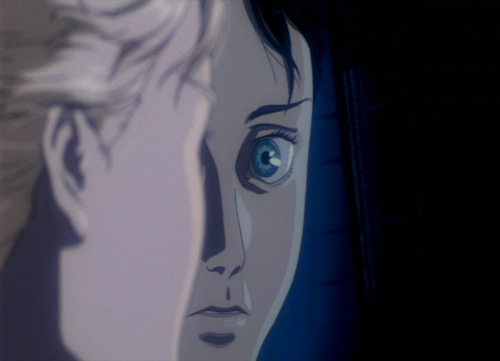 The picture obliquely signals Motoko’s barrenness in the Puppet Master’s mutually beneficial offer (apparently, there’s an earlier reference to her menstrual cycle, which doesn’t survive in the subtitled version), but most of the time she is singularly identified through parading around in sheer, flesh-coloured body stockings (and thigh socks), or further, flashing her cybernetic breasts (but, no doubt a knock-on from Japanese censorship rules, she is effectively absent genitalia). Also along these lines is the fetishisation of dismemberment, leaving isolated, immobilised, displayed female torsos; one might argue it’s simply there to emphasise the indifference of the replaceable body, but there’s a persistent to the male gaze that suggests otherwise. Unfortunately, such elements rather serve to highlight the anime’s shortcomings in terms of emotional range, an area the US remake, more overtly positioned towards exploring, also fails to capture. 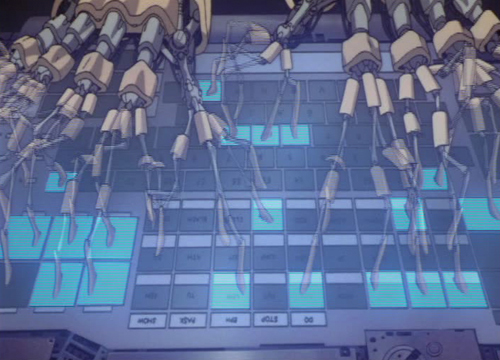 As far as influences go, the Wachowski sisters really are cap in hand to Oshii (“We wanna do that for real” they told producer Joel Silver, which might explain the lukewarm reception of someone doing Ghost in the Shell itself for real 18 years later – it had already been done), with such elements as The Matrix’s computer-generated green-on-black computer coding and the plug-ins into the backs of characters’ necks. They took the next step of depicting a malevolent AI (to humans, at least), of course, and structured their tale around a more classically defined hero narrative. 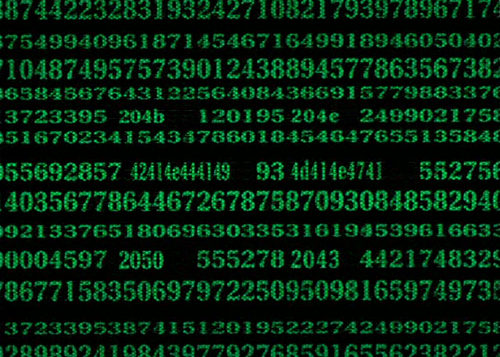 And The Matrix isn’t, really, so much about what it means to be human, or even so much what it means to be diminished as a human, and much more concerned with the nature of reality. Little since Ghost in the Shell has really made strides in addressing the former theme, and less still has done so with acumen (A.I. Artificial Intelligence succeeds to an extent). Perhaps we’ll need to wait for Blade Runner 2049 for the conversation to come full circle. Fingers crossed.